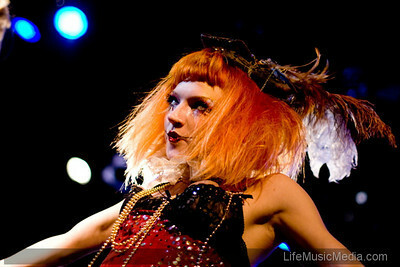 Last night, we encountered Emilie Autumn and her Bloody Crumpets at The Metro theatre, Sydney. Emilie Autumn’s performance was a two-hour theatrical extravaganza, a conceptual wing-ding that has only a tangential relationship to the normal procedures of rock ‘n’ roll. I recall Emilie’s My Space page a couple of years ago, which included portions of a predictable rock line of attack, and depicting evidence of this in the future events, with the maintenance of two support bands. It was, basically dubbed, a gig. But now, it’s a show, and the difference is distinct. Emilie Autumn has taken a decisive step towards theatre. No support bands tonight – just an elaborately dressed stage, some equally elaborately dressed Bloody Crumpets, and Emilie Autumn the queen of the performance. 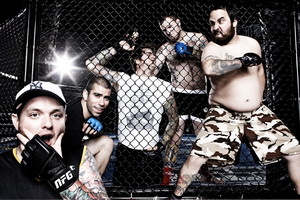 New Found energy, New Found purpose; New Found Glory is back in the ring. SURFit iPhone App Best Yet for 2010? Is this the first ‘must have’ iPhone app for 2010? Apart from being packed with world-firsts, in the midst of your day do yourself a favor, get SURFit on your iPhone and escape to the beaches and surf of Sydney, for at least a few minutes! 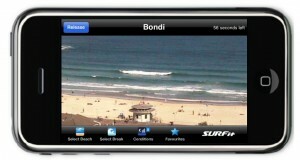 SYDNEY, Aust., 16th February 2010 – SURFit is a new iPhone app from SURFit.com featuring the famous beaches of Sydney Australia in a world-first, fun, interactive experience where you can control LIVE HD surfcams, optimized for 3G on your iPhone. What makes this app so hot? Chugg Entertainment confirmed John Mayer’s seven-date tour of New Zealand and Australia this April and May, including concerts in Newcastle and Wollongong. Bringing, in song, his latest on love, heartbreak and life lessons, it’s a wiser, more enlightened Mayer who, with the 70’s and 80’s California rock/pop sound of his new album, Battle Studies, heads to the Antipodes for a tour of the same name. The tour plays New Zealand first kicking off at Wellington’s TSB Bank Arena on Tuesday April 27 and Auckland’s Vector Arena on Wednesday April 28. In Australia the tour starts at the Brisbane Entertainment Centre on April 30, then Melbourne’s Rod Laver Arena on May 3. The summer heat was in full swing, but that didn’t stop punters from soaking up killer sets today, enjoying the first of two sold out Sydney BIG DAY OUTs. Capping off the show with an absolutely spectacular fireworks and fire cannon finale, the entire arena of Sydney Showground was lit up, as the BDO celebrated the eve of our 100th show. With seven BDO’s taking place across the nation (today’s show following on from successful events in Auckland on Friday 15th January, and the Gold Coast on Sunday 17th January), a sold-out crowd of 53,000 music fans kept their cool despite the soaring temperature. Making the most of the free water fountains and water stations across the BDO site, festival-goers took in 70+ acts hailing from both Australia and beyond, proving yet again why the BDO is Australia’s premier live music festival. UK trio MUSE headlined with an amazing set that had to be seen to believed – even inviting JET’s Nic Cester up onstage for a rendition of AC/DC’s “Back In Black”. LILY ALLEN seduced the crowd on the Orange Stage, while punters headed indoors to keep cool with SIMIAN MOBILE DISCO, GIRL TALK and CALVIN HARRIS in the Boiler Room. The Silent Disco also provided a reprieve from the heat. Aussie artists showcased yet again why they rival the biggest overseas names when it comes to live music. The TEMPER TRAP lit up the Green Stage with a huge singalong to “Sweet Disposition”, while hip-hop kings the HILLTOP HOODS nailed it over on the Orange Stage. In addition to the music, the BIG DAY OUT showcased a collection of visual art, including: sculpture that comes to life, progressive street art, film, and photography. The fireworks and fire canon spectacular took place shortly after Muse left the stage. The BDO reaches a mammoth milestone tomorrow, with the second sold-out Sydney event – taking place Saturday 23rd January – marking our 100th BIG DAY OUT show. St Johns Ambulance Commander, John Merlino reported that the majority of treatments across the day were heat related, including dehydration, exhaustion and sunburn. Despite this, figures were down on last year’s event. Tomorrow’s show (Saturday 23rd January) is expected to be another scorcher with an early evening storm predicted. Organisers urge everyone attending to take the necessary precautions to ensure they have a happy and safe day. Please keep hydrated by drinking lots of water, apply sunscreen before you arrive, and keep applying throughout the day. (Free sunscreen is available from the St Johns.) We strongly recommend you wear a hat. 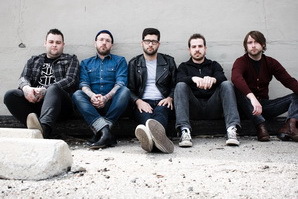 >From Sydney, the BIG DAY OUT travels to Melbourne, Adelaide and Perth. The line-up features some of the biggest names in the music world including MUSE, LILY ALLEN, DIZZEE RASCAL, PEACHES, KASABIAN, GROOVE ARMADA and many, many more. [Photo: Arfy Papadam] The first trip to the bathroom reveals that we’re in for a longer night than we could have possibly expected. It’s a Thursday night – a school night, I stress – and the bill on the door leading to the toilet declares that there will be five bands on the night. 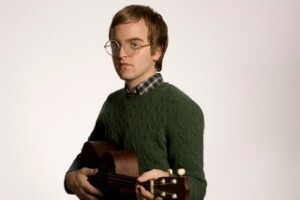 The last Fergus Brown is to start at a quarter to midnight, and will be filmed for the forthcoming feature film, LBF. 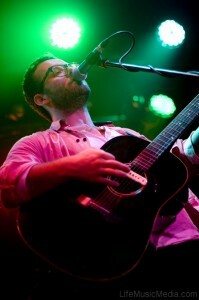 Brian Campeau is up first, and he’s brought one quarter of his band, The Common Misconceptions, along for support. She, a certain Elana Stone, accompanies on accordion and vocals. Brian Campeau is a folk singer – or at least what he does is grounded in folk; the reality is that the music is a little spacier than all that. 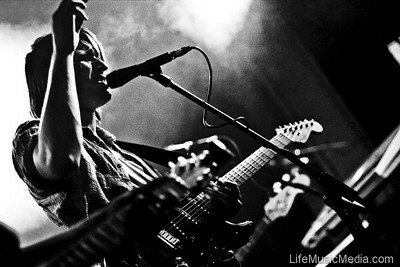 It’s partly the reverb and partly his inventive guitar playing style, in which the rhythm is supplemented by harmonics, trills, hammer-ons and surprisingly inventive tapping. He sings four songs, she sings two, and the crowd is entranced.